The E-Tense's jewel-like headlights update the beaded LED effect of current DS cars to outline the edge of the front vents. 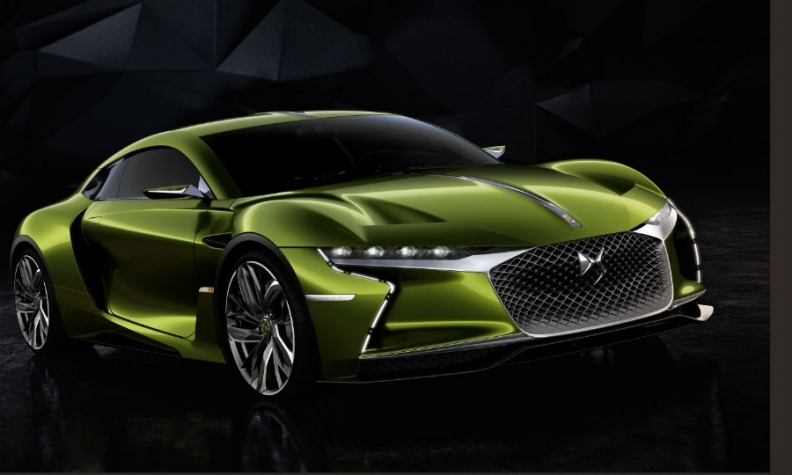 DS Automobiles, PSA/Peugeot-Citroen's upscale brand, has created the E-Tense, which it says is a test-bed for future electric vehicles. 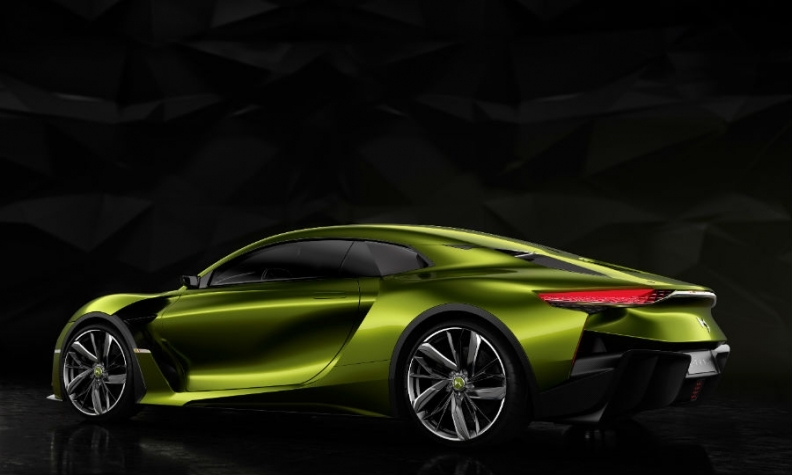 The two-seater sports car will be unveiled at the Geneva auto show on March 1. The car is built on a carbon-fiber platform and makes 402hp from its electric motor. It accelerates to 100kph (62mph) from standing in 4.5 seconds. The car’s electric drivetrain was developed at the DS Performance division in Satory, France, where the electric motor and transmission cooling for the DS Virgin Racing Team’s Formula E race car was also developed. “The E-Tense’s electric drivetrain is a test-bed for electric development going forward,” a PSA spokesman told Automotive News Europe. The E-Tense was designed at PSA’s design center in Velizy near Paris and advances the styling cues of the current generation of DS models. The jewel-like headlights update the beaded LED effect of current cars to outline the edge of the front vents, while the rear indicators are mounted on the roof to draw comparisons with the 1955 Citroen DS. The ‘scale-like’ rear LED lights “set the trend for future DS models,” the brand said in a statement. The E-Tense has the silhouette of a grand tourer coupe emphasized by a central chrome-plated spine and a metallic green ametrine body color. The car’s lithium ion batteries are mounted low down in the chassis for a more sporty drive. The car’s range is 310km (192 miles) and it weighs 1.8 tonnes. The length is 4.72m long, 1.29m high and 2.08m wide. Inside the DS upholsterers spent 800 hours to produce the interior with an updated version of DS’s ‘watch-strap’ design quilting for the leather seats and dashboard, the brand said. Accessories created with luxury French brands include a leather bag that doubles as a helmet carrier. 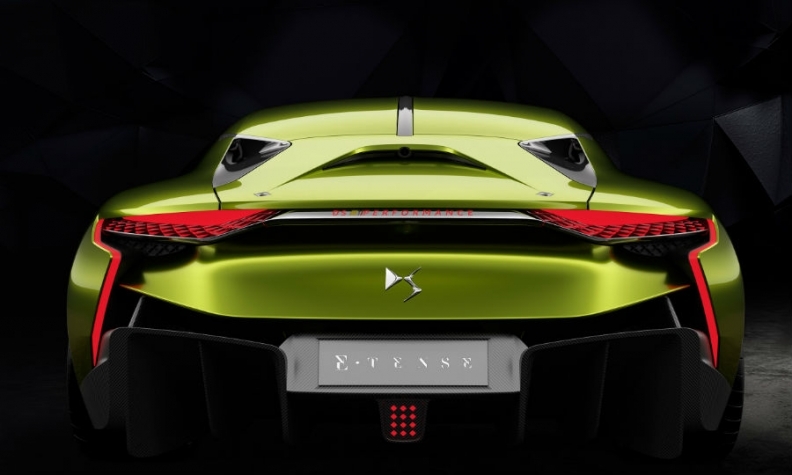 The E.Tenses's rear indicators integrated into the roof are inspired by the original DS from 1955. The lack of a rear windscreen gave the design team freedom to mold its contours and make use of digital rear-view technology, DS said. PSA has indicated it will launch a plug-in hybrid gasoline car in 2019. Additionally, Citroen head Linda Jackson last year said PSA had created a business unit to boost sales of electric cars and plans to launch EVs based on the EMP-1 small car platform by 2020. PSA separated DS from Citroen as a standalone brand in 2014 to challenge German premium marques such as Audi.